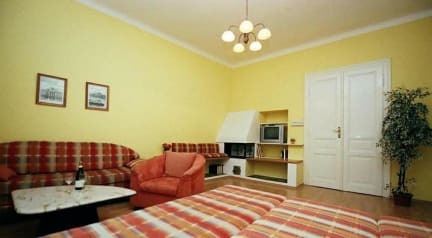 NEW APARTMENTS A few minute walk from Bratislava's pedestrian Old Town, a free pick-up from airport or the train/bus station if staying more nights, free WIFI in each room. Main sights as Castle, Main Square, St. Martin Cathedral, traditional restaurants, pubs in walking distance. New reconstructed, pretty spacious rooms. Private bathroom and kitchen in each room. SAUNA on your request. Excellent value for money compared to three/four star hotel. 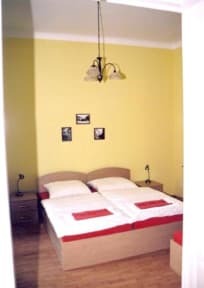 In case of booking Twin Private Ensuite or Double Bed Ensuite room for 4 or more nights transfer from Bratislava airport, train or bus station is free. In case of booking 4 Bed Private Ensuite room for 3 or more nights transfer from Bratislava airport, train or bus station is free. The apartment is located in a historical building in central part of town. It has recently been completely refurbished and furnished with brand new equipment. Luggage room: 5 EUR fee. bedroom, bathroom with shower or bath and toilet and fully equiped kitchen. Each room has two beds which can be connected as a double bed. Additional bed on request is possible for 15 EUR costs. two bedrooms, one bathroom with bath and toilet and fully equiped kitchen . The first room has one double bed and the second room has two separate beds. Additional bed for 15 EUR available. Bedrooms are spaceful and provide complete bathroom and shower, towels, linens, and television. There is a self-catering kitchen in each room with microwave, refrigerator, freezer, dinner service utensils and dining space as well.